Basara stands by the leg of his Battloid with a wrench. He eyes the open missile bay of his Battloid that is blistering with Missiles. Ray approaches him and asks him if he plans to remove the missiles. Basara tells Ray not to load missiles in his Valkyrie then proceeds to remove them. Ray however tells him that he was able to save Rex and Gamlin because of those missiles. He ends it by telling him to just leave it on because he'll never know when he'll need them again. Basara tells him that he's not in the military, but Ray answers back for him to just think like he's bringing an umbrella to a picnic where he'll never know when its going to rain. Basara answers back that he likes to get wet in the rain. Ray tells him that he doesn't have to use them if he doesn't want to so there's nothing wrong with leaving them in. This convinces Basara to leave the missiles alone. sings during the battles. He said that it turns out that he plays in a rock band. Gamlin asks her if she knows him, but Mylene tells him that she doesn't. Gamlin presses further by telling her that he saw him near her at the Riviera ship. Mylene however follows the same tac that she doesn't know him then changes the topic by saying that her drink tastes good. Then she says that she'd like to meet that selfish person who flies out and disrupts the battle with his singing. Ray informs Basara that Mylene was able to get some recording work for them. Basara however expresses that he doesn't like it. Ray however is able to convince him otherwise by telling him to take it as a challenge for him. Gamlin gives Mylene a gift of a "tsumugi" kimono after he escorts her to her car in the parking lot. Gamlin tells her that its supposed to calm people around her whenever she wears it. Mylene thanks him profusely and Gamlin requests that she wear it the next time they go out again. As he watches Mylene leaves, Gamlin thinks to himself that its obvious that Mylene knows Basara but he wonders why she has to lie to him about it. Kinryuu his squadron leader suddenly taps him from him behind and comments that everything seems to be going well between Mylene and him. Also that this is a good chance to get close to Mayor Milia, her mother. And that its a great way to advance in the military. Gamlin however tells him that he wasn't thinking of it that way and if he liked he could introduce him to Mylene. Kinryuu however says that he's too old for Mylene then turns around and reveals that he's taking Bridge operators Miho Miho and Sally to the same restaurant. Gamlin thinks to himself that Kinryuu just took out two younger women at the same time. At the recording studio, Basara walks out of the recording after getting into a disagreement with the manager. "Honey" Suzuki (thats a guy) wants the band to play a more popular type of melody in order to make it more appealing to the public. Mylene runs after Basara while Ray just tries to make an excuse to "Honey" that Basara has a lot on his mind. 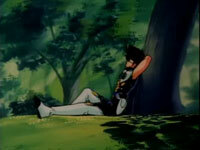 Flower Girl sees this as her chance again to give her flowers to Basara, as she sees him sitting alone under a tree. Before she can get to him however, Mylene runs past her and beats her to Basara. Mylene scold Basara for walking out of their first recording. Telling him that this could be their chance to break out and he should therefore take it more seriously. When she says the name of the band during her scolding of Basara, Basara suddenly changes the topic by saying that they have to find a sound for the band that is more powerful than missiles. He refers to this sound as "Bomber." Mylene tells him that he doesn't understand, but Basara tells her that it has nothing to do with her. Ray, who was listening behind them with Veffidas, echoes Basara's sentiments of a sound more powerful than missiles. Veffidas surprises everybody when she suddenly speaks and tells Mylene that there's really no point in reasoning with Basara. Back at Mylene's room, the news is blaring that the authorities still haven't been able to stop the vampire attacks. Mylene talks out loud to Guvava on what Veffidas said, that you can't reason with Basara. She wonders how she can make him understand. 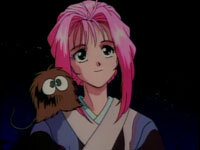 Mylene visits Basara at the park in the evening wearing the special kimono that Gamlin gave her. Mylene asks Basara if he could try to work together with "Honey" Suzuki during the recording. Basara however tells her that its No Good, because the man wants a different sound for the band that Basara doesn't like. Mylene, visibly depressed, thinks to herself that Gamlin was wrong in telling her that wearing this would calm people around her. Basara takes one look at her then says that he'll give it one more chance to work things out with the director. Gigil asks to speak with Lord Gepelnich. He asks why they aren't attacking their enemy all at once like what they did over 500,000 years ago. Lord Gepelnich tells him that he's been dreaming a lot lately of a way to gather spiritia without hunting prey. He still doesn't know whether this is real or not, so he seeks to investigate it further. Gigil turns around and thinks to himself that he doesn't understand what Gepelnich means, only that he knows that hunting prey is fun. In the middle of their recording "Honey" Suzuki once again scolds them for their sound and reminds them that they have to finish recording because they have already set a release date and that a large advertising campaign is about to be started. Mylene apologizes to "Honey" when the alarm sounds. Basara looks at Mylene and mutters the word "Bomber", then once again flies out the door. Honey asks them if they want to give up already, if they do, that he'll still bill them for the recording. Ray pushes him out the door and tells him that they'll work something out. Before taking off Kinryuu instructs Diamond Force that there is more enemy aircraft than usual and that Physica should stick close to Gamlin and him. Formation D-15 is what they will be using this time. As they fly off however, Gamlin recognizes Gigil's Battloid as the one who attacked him last time. The attack had landed him in the hospital. Gamlin goes after him and Kinryuu screams at him to remember their D-15 formation. Basara comes in and screams at them to listen to his music which is more powerful than missiles. Kinryuu tells Physics to back up Gamlin as their formation is now shot. Gamlin contacts Basara and tells him that can he sing if he wants to, but he will prove to him that his singing is meaningless in the battlefield. The rest of Fire Bomber is playing along with Basara inside the studio. The technicians are recording the performance but comment that the sound quality is awful. Gamlin gets the edge on Gigil and is able to shoot off his gun pod. This forces Gigil to call for a retreat. While listening to the recording Honey tells them that he cannot use the recording, this leaves Mylene depressed. Ray however comforts her by telling her that its only Honey who thinks that the recording is bad. Akiko comes in and tells Honey they she will be the one to buy the recording. Honey insults her by telling her that she will just be wasting money on this. Akiko thinks otherwise by telling him that she think it will be a hit. After the battle, Basara floats out in the debris in his Battloid. Gamlin contacts him and tells him that he hopes he realized that it was the military that won the battle today and not his music. Basara however just tells himself that one day he'll make them understand his music.